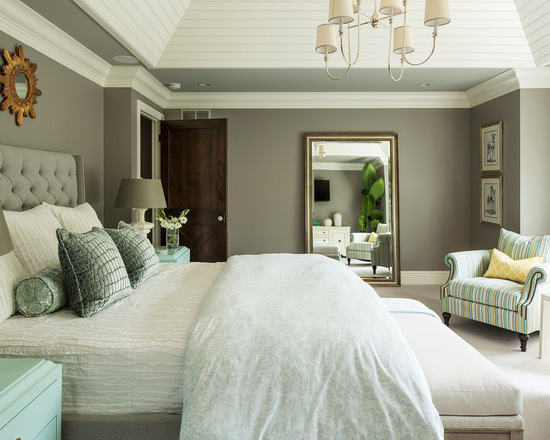 Punches of aqua augment the warm gray walls in the master bedroom. Tongue and groove paneling adorns the tray ceiling. Paint: Winter Gates, Benjamin Moore. For some people, pale purple can look juvenile, but by adding black and white accents and elegant accessories, such as the lighting fixture shown in this bedroom, lavender will look mature and sophisticated. This paint color is Slip by Benjamin Moore. Tell us: Have you used tints in your home? Please let us know in the Comments. Read more stories about decorating with color. 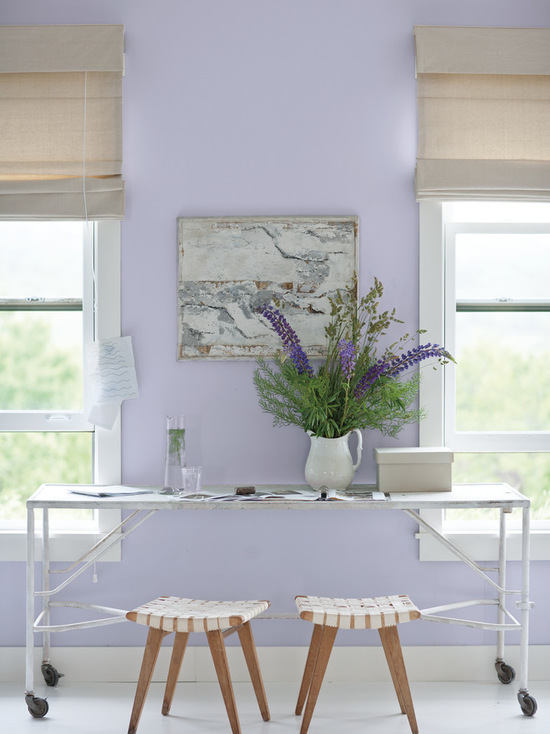 Pale purple bedroom with walls painted in Slip by Benjamin Moore via Jackson Paige Interiors, Inc. Tips – Take a cue from the color palette in the room: If the walls are a cool color (green, blue, gray, purple), choose a cool white trim; if the walls are a warm hue (red, pink, brown, orange, yellow), choose a warm white trim. For cool white trim, try Site White SW7070 from Sherwin-Williams, Full Moon 780E-2 from Behr, Mineral Ash 7006-19 from Valspar or Horizon from Benjamin Moore.For warm white trim, try Creamy SW7012 from Sherwin-Williams, Popped Corn W-B-200 from Behr, Snow Cap 7003-8 from Valspar or Acadia White OC-38 from Benjamin MooreGuide: Trim Color Tips: Get Your White Trim Right. Cool lavender, such as the one shown here, creates a centering, contemplative mood that works well in bedrooms and meditation rooms. Try putting this hue with silver, cool grey and crisp white. In this calming room by Aquidneck Properties, the walls are painted in Benjamin Moore’s Quiet Moments in an eggshell finish, while the ceiling has been covered in white-painted beadboard, which adds cottage charm. Another option is to bring bold purple hues into your bedroom via textiles, and then pick a lighter lavender shade for the walls. You’ll get a nice hint of soothing color in your bedroom that relates to the bolder hues in the accessories. 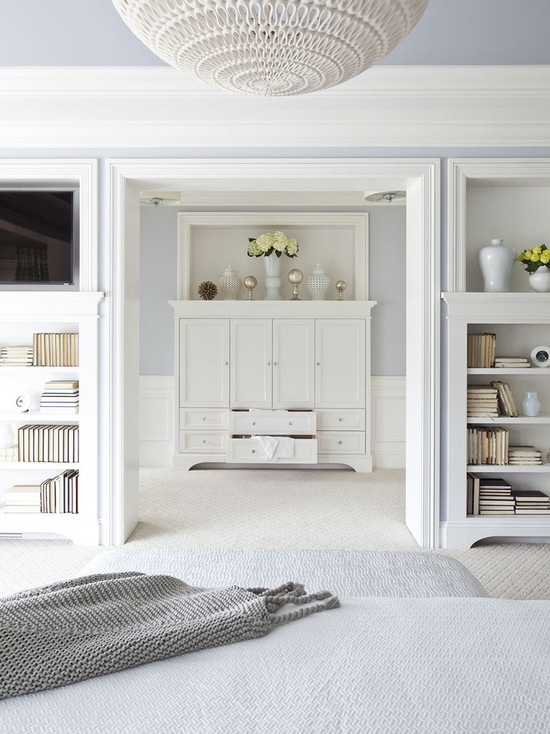 Stunning gray and white bedroom with walls painted in Benjamin Moore Silver Gray 2131-60 and White Dove Trim. From Martha O’Hara Interiors. Benjamin Moore Silver Gray 2131-60 and White Dove Trim. This entry was posted on Thursday, July 21st, 2016 at 10:14 am	and is filed under Bedrooms, Grey, Neutrals, Purple. You can follow any comments to this entry through the RSS 2.0 feed. You can leave a comment, or trackback. I am Pandora. A lover of interior design, decorating, homes, gardens and all things stylish! I have been studying interior design as a side project for a few years on and off and decided to make this blog where I jot down my ideas and inspirations in the hopes that they will help or inspire others. 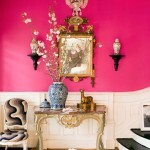 I am particularly in love with devising new color schemes an will try to add some of that here too. This home and decorating site is a work in progress for me so come back often to see new ideas! Inspiration bedroom design blog. You can search by style, color or trend.